St. Jude, glorious apostle, faithful and friend of Jesus, the name of the traitor has caused you to be forgotten by many. But the Church honors and invokes you universally as the patron of hopeless cases, and of things despaired of. Pray for me who am so distressed. Make use, I implore you, of that particular privilege accorded you to bring visible and speedy help where help was almost despaired of. Come to my assistance in this great need that I may receive the consolation and succor of Heaven in all my necessities, tribulations and sufferings, particularly, (mention your request) and that I may bless God with you and all the elect throughout eternity. St. Jude, apostle, martyr, and relative of our Lord Jesus Christ, of Mary, and of Joseph, intercede for us! O blessed apostle St. Jude, who labored zealously among the Gentiles in many lands, and performed numerous miracles in needy and despairing cases, we invoke you to take special interest in us and our needs. We feel that you understand us in a particular way. Hear our prayers and our petitions and plead for us in all our necessities especially. (mention your request) May we be patient in learning God's holy will and courageous in carrying it out. Amen. O blessed apostle Jude, who has been instrumental in gathering us here together this day, grant that we may always serve Jesus Christ as he deserves to be served, giving of our best efforts in living as he wishes us to live. May we dispose our hearts and minds that god will always be inclined to listen to our prayers and petitions, especially those petitions which we entrust to your care and for which we as you to plead for us. (mention your request) Grant that we may be enlightened as to what is best for us, in the present and future, not forgetting the blessings we have received in the past. Amen. O holy St. Jude, apostle of Jesus Christ, you who have so faithfully and devotedly helped to spread his Gospel of Light, we who are gathered together today in your honor, ask and petition you to remember us and our needs. Especially do we pray for. (mention your request) May it also please our Lord to lend an ear to your supplications in our behalf. Grant that we may ever pray with fervor and devotion, resigning ourselves humbly to the divine will, seeing God's purpose in all our trials and knowing that he will leave no sincere prayer unanswered in some way. Amen. 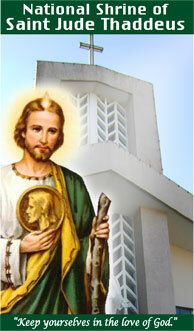 Saint blessed Jude, you were called to be one of Christ's chosen apostles and labored to bring men to a knowledge and love of God; listen with compassion to those gathered together to honor you and ask your intercession. In this troubled world of ours we have many trials, difficulties, and temptations. Plead for us in the heavenly court, asking that our petitions may be answered, especially the particular one we have in mind at this moment. (mention your request) May it please God to answer our prayers in the way that he knows best, giving us grace to see his purpose in all things. Amen. O holy St. Jude, apostle and companion of Christ Jesus, you have shown us by example how to leas a life of zeal and devotion. We humbly entreat you today to hear our prayers and petitions. Especially do we ask you to obtain for us the following favor. (mention your request) Grant that in praying for present and future favors we may not forget the innumerable ones granted in the past but often return to give thanks. Humbly we resign ourselves to God's holy will, knowing that he alone knows what is best for us especially in our present needs and necessities. Amen. St. Jude, apostle of Christ and helper in despairing cases, hear the prayers and petitions of those who are gathered together in your honor. In all our needs and desires may we only seek what is pleasing to God and what is best for our salvation. These, our petitions (mention your request) we submit to you, asking you to obtain them for us, if they are for the good of out souls. We are resigned to God's holy will in all things, knowing that he will leave no sincere prayer unanswered in some way though it may be in a way unexpected by us. Amen. O holy apostle Saint Jude, in whose honor we are gathered today, may we never forget that our Lord and Savior Jesus Christ chose you to be one of twelve apostles. Because of this and of the martyrdom you suffered for the Faith, we know you are a close friend of Almighty God. Therefore we do not hesitate to petition you in our necessities, especially. (mention your request) We humbly submit ourselves to the will of God, knowing full well that no sincere prayer is ever left unanswered. May we see god's good and gracious purpose working in all our trials. Amen. O holy Saint Jude, apostle of Christ, pray that we may ever imitate the Divine Master and live according to His will. May we cooperate with the grace of God and ever remain pleasing in His sight. Especially do we ask you to plead for us and obtain whatsoever is necessary for our salvation. Forget not our special petitions. (mention your request) May we always be thankful to God for the blessings we have received in the past. Whatsoever we ask for the present or future, we submit to the divine will, realizing that God knows best what is good for us. We know He will respond to our prayers and petitions in one way or another. Amen. O holy Saint Jude, apostle and martyr, grant that we may so dispose our lives that we may always be pleasing to God. In working out our salvation in this life we have many needs and necessities. Today we turn to you, asking you to intercede for us and obtain for us the favors we ask of God. Especially do we petition for. (mention your request) May we not so much seek temporal good but rather what will avail our souls, knowing that it will profit us nothing if we gain the whole world yet suffer the loss of our soul. Therefore, may we incline ourselves toward the divine will, seeing God's good and gracious purpose in all our trials. Amen. Hi Noel! I understand how hard your health situation is right now. Just hang in there! God is in control. Glad to know that Angel is attending the novena for you while you do it in your own place of work. I'm sure St Jude understands. Stay strong, in body mind and spirit! Will pray along with you! thanks Beng. to tell you the truth, the only time i visit the church is on sundays, not regularly though. This is a great post and indeed a powerful novena. I think praying in your own place of work is just fine, really anywhere, anytime -- as Beng Gee wrote, I'm sure St. Jude understands. Don't despair. Your faith and your will for you and your family, together with the help of your doctors, will help God to heal you. Will keep you and your family in my prayers! Hang in there! Hi Noel, St. Jude was part of our topic last week when was asking me where to go to pray for impossible. I wasn't really a religious person but I believe that spiritual belief, prayers and good hearts had made a greater part to my mom’s survival from Gestational Trophoblastic Diesis :). You are lucky enough to have those three with you as you go through these rough roads. God bless you! thanks Buzz for those words of encouragement and including us in your prayers.